The sports tour was a fun and exciting trip for year 6 boys to go on. The boys played three rugby matches against strong sides from Worcester: King’s St Albans, Abberley Hall and King’s Hawford. After the coach journey to Worcester, we played King’s St Albans. The boys A team and B team both won their matches. After that, we went to have tea and then we went bowling and got slush puppies. Bowling was fun, especially when Sam threw the ball into the wrong lane and got a strike! free samples. 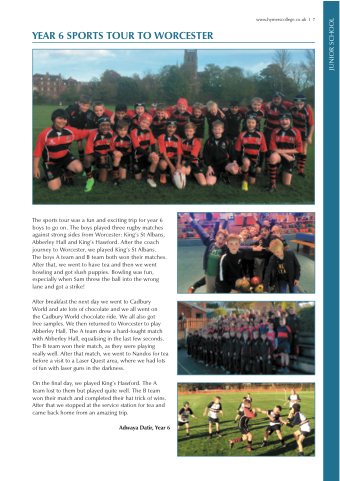 We then returned to Worcester to play Abberley Hall. The A team drew a hard-fought match with Abberley Hall, equalising in the last few seconds. The B team won their match, as they were playing really well. After that match, we went to Nandos for tea before a visit to a Laser Quest area, where we had lots of fun with laser guns in the darkness. On the final day, we played King’s Hawford. The A team lost to them but played quite well. The B team won their match and completed their hat trick of wins. After that we stopped at the service station for tea and came back home from an amazing trip.